The common names Brown Mushroom or Fuzzy Mushroom may draw a mental picture of a drab mushroom, but this guy has a few color surprises! The Actinodiscus malaccensis species is also known as the Metallic Mushroom or Green Metallic Mushroom, and can be a very attractive mushroom indeed. These mushroom corals come in brown, green, gray or beige-brown and they have little short tentacles that can be a combination of these colors. The name Fuzzy Mushroom denotes a much more pronounced texture than other mushrooms in this genus, and they will grab larger particulate matter from the water column. Keeping the Green Metallic Mushroom is almost bullet proof. They are easy to care for though they actually do prefer a little more light than other Actinodiscus species. They can handle higher levels of nitrate than SPS and LPS corals, but they do not handle a high water flow. These corallimorphs are well equipped with nutritional alternatives for their well-being. They derive nutrition from their symbiotic algae, zooxanthellae, that dwells within their tissues and they eat small particles out of the water column. They can also be fed liquid coral food or Cyclo-peeze and similar sized foods. The Green Metallic Mushroom propagates easily in captivity, though after splitting the clone mushroom doesn't necessarily always resemble the "mother" mushroom. They are semi-aggressive if they are near another coral. They will cause other corals to loose tissue, recess, and possibly die. Acroporas will not grow in aquariums with large mushroom populations. A. malaccensis have very few predators if any. This is a variation of the Actinodiscus genus, where the rudimentary "tentacles," which are usually more like small bumps, are more pronounced. They are easy to care for and will split and reproduce offspring that may be different in color than the main mushroom. These are great for nano tanks, only reaching 2 to 3" in diameter! Mushroom Coral Information: The Green Metallic Mushroom, Brown Mushroom, or Fuzzy Mushroom Actinodiscus malaccensis was discovered by Ruppell and Leuckart in 1828. Other names they are known for are Metallic Mushroom, Mushroom Rock Actinodiscus, Coral-like Anemone, and Jewel Anemone. Some general common names they are known by are Disc anemone, Mushroom coral, False Anemone, Mushroom anemone, Shrooms, and Mushrooms. As far as current taxonomy, the A. malaccensis is listed under Actinodiscus and not Discosoma, according to the 2007 taxonomy list. The taxonomical identification of mushroom corals has a history of limited and dated information which is often of dubious value and sometimes incorrect. Mushrooms corals have no fossil records and studying the physical aspects has proved to be not very reliable for identification. Modern methods using DNA and RNA testing to deduce the sequence of genes, though more reliable, is not readily available. Where Mushroom Corals Are Found: The Actinodiscus malaccensis are found in the Central Indo-Pacific Ocean, specifically from the Dutch East Indies all the way to Fiji. Mushroom Coral Habitat: Green Metallic Mushrooms prefer shallow lagoons and tide pools. They like to grow on dead corals, rubble, and between coral heads. They feed off particles and small zooplankton in the water column, using their little tentacles. A. malaccensis propagates easily in captivity, which can contribute to preserving the wild populations. Even after splitting, the clone mushroom doesn't necessarily always resemble the "mother" mushroom. They have very few predators if any. What do Mushroom Corals look like: Green Metallic Mushroom, Brown Mushroom, or Fuzzy Mushroom Actinodiscus malaccensis are basically a coral without a skeleton and their internal structures are the same as stony corals. The top of their body or the upper surface is called the oral disc. The stalk area, which is very small, is called the column and it is located just above the pedal disc, which is where they attach to surfaces. The A. malaccensis come in brown, green, gray or beige-brown and they have little short tentacles that can be a combination of these colors. Brown specimens are found in deeper water and those with gray green colors will fade if lighting is too low. Although they don't have the extremely long feeding tentacles, their short tentacles serve them well by holding several types of stinging cells. These tentacles do allow them to catch larger particulate matter than the other Actinodiscus species are able to catch. They can actually warp their surfaces to change the water flow over them to direct particulate and flocculent material toward their mucous center for absorption. At times they will make a trumpet shape. This is thought to be formed when they are needing nourishment, or if the light level is low, or is of low quality due to age. Mushroom Coral Life Cycles: Green Metallic Mushrooms can grow up to 2-3" (5-8 cm) but their life span is unknown. Mushroom Coral Care: The Green Metallic Mushroom is easy to care for and they do handle brighter moderate light better than some mushrooms. If kept in tanks with high output lamps they should be kept in shaded areas. If they are not shaded, they turn all brown and fail to thrive. Some will just float around the tank until they find a nice shaded area or have an unpleasant encounter with a pump. They cannot handle high water flow and strong water movement will also cause them to detach. They can handle higher levels of nitrate than SPS and LPS corals. Mushroom Coral Feeding: The Green Metallic Mushroom is a carnivore. In the wild, these corallimorphs are well equipped with nutritional alternatives for their well-being. They derive nutrition from their symbiotic algae, zooxanthellae, that dwells within their tissues and they eat small particles out of the water column. Their short tentacles also serve them well by holding several types of stinging cells which allow them to catch larger particulate matter than the other Actinodiscus species. Finally, they can actually warp their surfaces to change the water flow over them to direct particulate and flocculent material toward their mucous center for absorption. In captivity you can feed your A. malaccensis liquid coral food or Cyclo-peeze and similar sized foods. You can use direct feeding, but they still do well on their own capturing food all by themselves. Feed once a week if desired. Water changes of 10% bi-monthly or 20% a month are typical. Provide a reef environment with proper magnesium levels. Some claim proper iodine levels are beneficial also. Due to their toxins, active carbon is a good idea with larger colonies of mushrooms. A typical live rock/reef environment is what is needed for your Green Metallic Mushroom. Provide rubble or dead coral and live rock for them to have something with which to attach their pedal disc. They do not do well with strong water movement, so direct the powerheads and intake nozzles away from them. As they can float around when looking for a place to settle, it's a good rule of thumb to have all of your pumps covered. Most good quality pumps have guards on them. Do not over skim since the A. malaccensis need nutrients to survive on and will not do well in a pristine environment. Marine Lighting: Low to moderate. 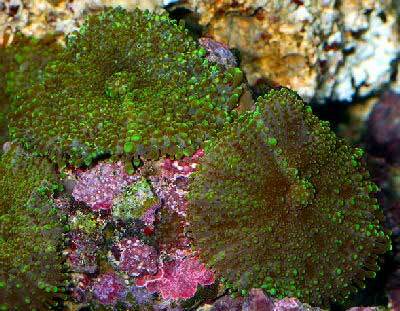 The Green Metallic Mushroom, Brown Mushroom, or Fuzzy Mushroom is semi-aggressive if they are near another coral. They will cause other corals to loose tissue, recess possibly die. Acroporas will not grow in aquariums with large mushroom populations. Make sure to leave 6 - 8 " between your mushrooms and other corals. Watch the growth rate since the A. malaccensis will overgrow and kill any nearby corals. Mushroom Anemones will tolerate their own species and usually other Mushrooms. In the wild many species of Mushroom Corals occur together in large groups. In captivity A. malaccensis will get along with their own species, but may not tolerate mushroom species outside their colony. Even in one genus, if the color is different or a different species, the weaker mushroom will detach and find another location. Corallimorphs reproduce in 4 different ways. The first three ways, asexual budding, laceration, and division/fission, are successful in the aquarium as most hobbyists soon discover. Budding is where individuals are formed from particles divided off from the pedal disc. Similar to budding, laceration happens when they move slowly over the surface and leave behind small pieces that will eventually form into mushrooms. Division or fission is where an individual divides down the center and forms two animals. Sexual reproduction is where eggs and sperm are released into the water column. They unite and form free-swimming larvae which are initially plankonic, and them settle and adhere to the substrate. Sexual reproduction has not been well documented, and has not been observed in captivity. Presumably modern filtration methods are inhospitable to free swimming larvae. Mushroom corals can be easily propagated in captivity by cutting individual polyps into several pieces. Placed the pieces on a gravel substrate with low water flow. They will attach themselves to pieces of gravel. Later they can then be super glued to a suitable substrate such as a reef plug. It has been stated that the warmer end of their temperature spectrum encourages reproduction. The A. malaccensis are disease resistant, and only affected by improper husbandry. Problems for the most Corallimorphs are pretty minimal unless your lighting, water movement, feeding and water quality are improper for these animals. A sign of this is if your coral mushroom detaches to look for "better conditions" to settle in. They have very few predators if any.